Krispy Kreme celebrates their 81st birthday by offering a dozen Original Glazed Donuts for $1 when you buy any dozen donuts at participating US and Canada shops on Friday, July 27, 2018. As part of the occasion, they'll be serving up the new birthday-themed Glazed Confetti Donuts for one week starting Friday, July 27, 2018 (and running through Thursday, August 2) at participating shops, while supplies last. 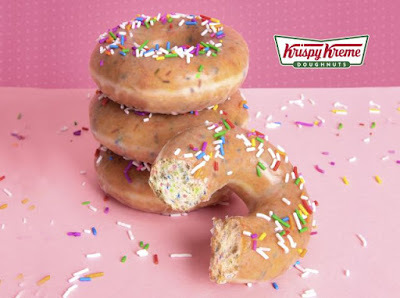 The new donut features a vanilla birthday cake-inspired dough interspersed with confetti sprinkles, glazed in the chain's signature Original Glaze, and finished with more rainbow sprinkles.